Goats wear ear tags to identify them as free from scrapie, an infectious degenerative disease of sheep and goats that eventually kills affected animals. Scrapie occurs far more often in sheep, who must also wear tags, than goats. 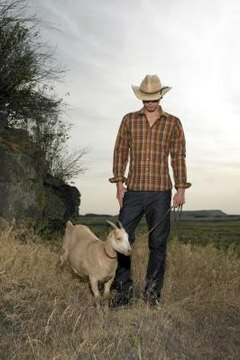 The United States Department of Agriculture, under its scrapie eradication program, requires the tags in goats to prove the animals originated in scrapie-free environments. Individual states have their own tagging requirements. Goats affected with scrapie display behavioral and neurological changes. Other symptoms include gait abnormalities, lack of coordination and weight loss although eating well. The only definite way to diagnose scrapies is brain necropsy. Goats suspected of harboring the disease are put down. You can purchase ear tags for your goats directly from the USDA or through one of the USDA's approved companies. While the USDA will send you free tags, the government-approved companies allow you to choose, for a fee, tags in various colors and styles. Goats require official ear tags before they are moved off the birth premises. The only exception is for kids under the age of 18 months headed directly to slaughter.